Whitebeam or Sorbus aria, sometimes known as chess apple, quickbeam, and white hazel. The (common) Whitebeam is one of our native trees. It is a tree of hedgerows and chalk downland (and cliffs !). It tends to favour lime-rich, clay based soils. It is mainly found in the South but localised pockets and ‘variants’ occur elsewhere. For example, around the Avon and Cheddar Gorge area has been intensively investigated in recent years. It is found further north, where it has been (extensively) planted. 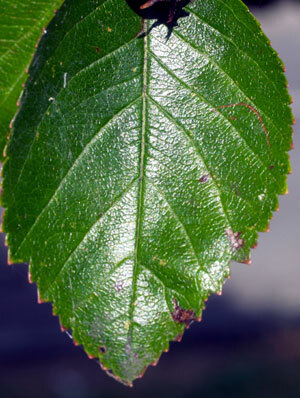 There are a number of forms of Whitebeam, for example, the Bristol, Lancashire, and Somerset Whitebeam. There is considerable diversity in form, and much discussion about the different sub-species and localised forms. The more unusual species tend to be polyploid; i.e. they have multiple copies of the chromosome set and reproduce by apomixis. Apomixis is a form of reproduction which does not involve the usual sexual system of gamete production through meiosis and subsequent fusion of dis-similar gametes. Seeds and fruits develop without pollination and fertilisation. The whitebeam leaf is ‘oval’ with a distinctive white-green appearance and it has a serrated edge (margin). When the leaves first appear, the surface is silvery green, but as they age they become greener and darker though in Autumn they can assume a golden / russet colour. 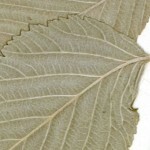 The white undersides of the leaves are particularly distinctive in Spring – the 'whiteness' being due to a dense layer of hairs. The bark is quite smooth and grey (when the tree is young), darkening as the tree ages. 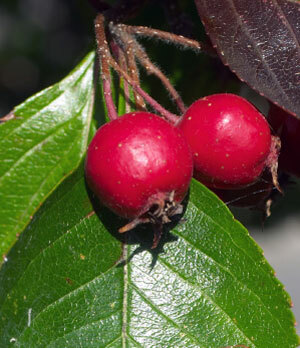 The buds arise alternately along the twigs – they are green with reddish scales; and they 'grow out' from the stem. The tree may grow to a height of 15 to 25 metres, forming a dense crown which fills with upward sloping branches. It may live for some 70 - 80 years. In the Spring, clusters of white / cream-coloured, scented flowers form. There are five petals to each flower. When pollinated and fertilised, these will turn into green and then red berry-like fruits (which contain black seeds). Sorry, no images available at present.